Is there any historical or great, positive significance that I can tie to the number 71? Was ice cream invented on the 71st day of the year or anything? My rally towel arrived today along with a few pages of initial instructions. Over and over the Rallymasters have stressed that reading comprehension will be a rider’s best friend. I’ve read everything slowly, over and over again. The next thing to come will be the rally book and bonus list, which I will use to plan my route for the rally. I wish I had that right now! With just a week before lift off, I would say I am more excited than nervous. I have no assumptions about being great at this, but I’m looking forward to riding, seeing stuff and just doing it because well,… it’ll be fun. 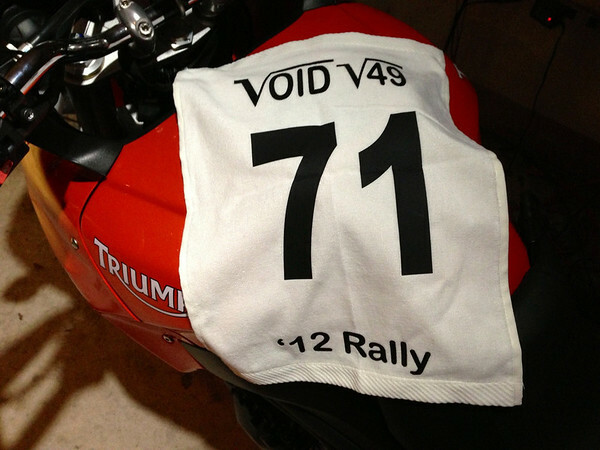 The Void has a Yahoo group that allows participants to communicate with each other and the rally staff. Quite a few other riders have reached out to me to offer support, suggestions and tips after I mentioned that this will be my very first rally. There are some really good and kind people out there. I get reminded of that often. I’m TEAM 71 all the way! W00T!!! You will totally Rock The Void, Fuzzy! 😆 Thanks, Wen- I’ll take it! Lots and lots of good vibes coming your way. I think 71 is a lucky number, but then I might be biased as I was born in 1971. Only one more week. You are going to have so much fun!! Thanks, T 🙂 I sure appreciate it! I like that number! 71. Very solid. So proud of you! I’m team 71 too. Thanks, Pam- Big hug to you! 71? I got 71 points over 80 in my Geometry exam! I thought I would not think a thing connected with 71. It seems like I just did. Number 71 is my new favorite number, go team 71!